To preserve all your hard work—particularly if others use your files—protect it with a password. You can protect a sheet or an entire workbook. 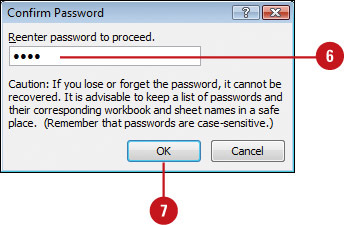 In each case, you’ll be asked to supply a password, and then enter it again when you want to work on the file. 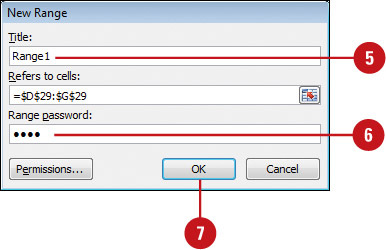 Passwords are case sensitive, so be sure to supply your password as it was first entered. If you forget a password, there is no way to open the file, so it’s very important to remember or write down your password(s). Keep your password in a safe place. Avoid obvious passwords such as your name, your company, or your favorite pet. 2. Click the Protect Sheet button. 3. 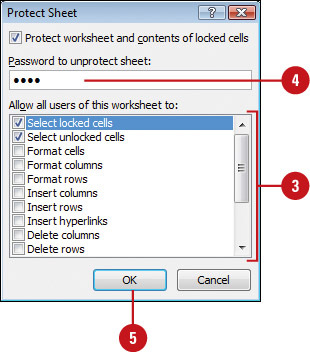 Select the check boxes for the options you want protected in the worksheet. You can protect workbook elements. Click the Review tab, click the Protect Workbook button, and then select or clear the Structure or Windows check boxes. Select the Structure check box to prevent users from viewing, copying, moving, or inserting worksheets. It also prevents users from recording new macros, displaying data from PivotTable reports, using analysis tools, or creating scenario summary reports. Select the Windows check box to prevent users from moving, resizing, or closing windows. 1. Select the range in which you want to apply a password. 3. Click the Allow Users to Edit Ranges button. 5. If you want, type a range title. 6. Type a range password. 10. To modify or delete a range, click a range, and then click Modify or Delete. 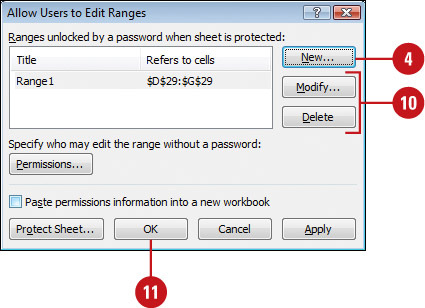 You can quickly unprotect a worksheet or workbook. Click the Review tab, click the Unprotect Worksheet or Unprotect Workbook button, type the password, and then click OK.